Aquarius Severn Astrology Society - Aquarius Severn Astrology Society - regular talks, classes and workshops with top astrologers. Open to all. 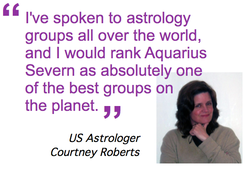 Since 1981, Aquarius Severn has provided a forum for astrology and related subjects, encouraging exchange of ideas, learning and an exploration of the nature and meaning of astrology. We provide a gathering place where you can find out more about the many facets of this fascinating subject. Our talks are an opportunity to meet with people from a variety of backgrounds and ages with a shared interest and experience of astrology. ​We hold monthly talks and discussions, and on occasions astrology classes and workshops with national speakers, and a field trip round about the Summer Solstice. • an astrological take on current events or someone in the news. All evening talks take place on Thursday evenings, 7.30 to 9.30pm at 2 Wolseley Terrace Oriel Rd Cheltenham and cost £7.00, or £5.00 for members. ​Entry for students is £3. For a map and parking details see our Location page. We are close to the bus stops at The Promenade. We also hold socials which usually involve a visit to a local pub or café and often a walk, plus a celebratory meal in the depths of Winter. You don’t have to be a member to attend, but by taking out an annual or half-yearly membership, you pay £2 less at talks, are eligible for discounts at other events and on purchasing new astrology books, and have access to our lending library. Further down this page you can see our current programme. You can also sign up to our talk reminder service (see right). Can you help Aquarius Severn? Our talks are on the first Thursday of the month, with socials usually on a Thursday evening in May and August, a Saturnalia meal in late January and a field trip in mid Summer. Check below for details, or sign up to our mailing list. A horoscope can reveal many different facets of our life. Initially we are interested in how the planets affect us, but sooner or later we want to know how we relate to other people. Are we compatible with a particular person ? Why do I keep attracting individuals with the same characteristics ? The technique of Synastry, that is the comparison of two or more charts, helps provide answers to some of these questions. Friends, family, partners, people you don't get on with, even relationships between an individual and a company or country can be viewed in this light. In this session Chris Burgoyne will take us through the key areas involved in Synastry looking at charts of the famous and the not so famous. Chris Burgoyne was a regular at Aquarius Severn before moving to Devon and has presented several engaging talks here over the years. Join us for a short evening walk in the spring countryside followed by a meal at a country pub. There will be convivial astro-chat and the odd mystery birth chart to ponder! Details t.b.c. - register your interest for now. London astrologer Veronica Dodds asks what astrology can offer healthcare in the 21st Century. How can we make the most of Neptune in our birth charts, particularly if it is prominent or in aspect to our personal planets? What should we expect from Neptune transits? Is it possible to avoid losing one's boundaries completely or can this sometimes be a positive experience? 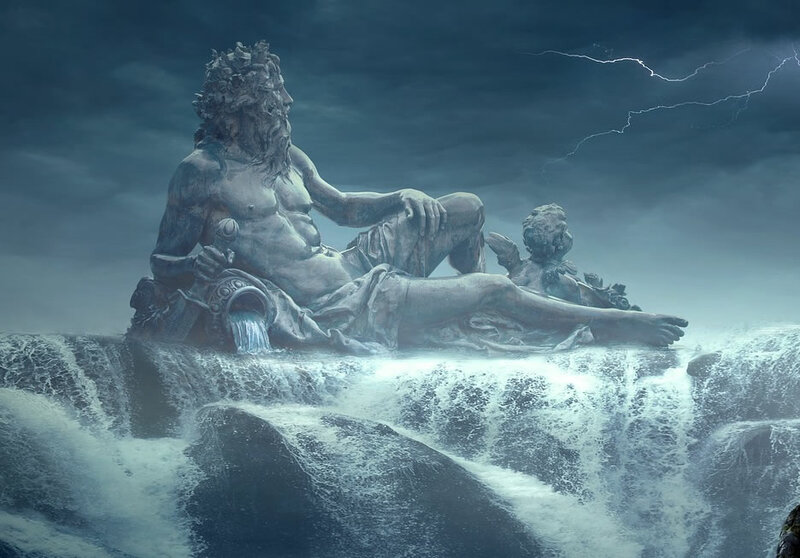 Astrologer and psychotherapist Richard Swatton brings his deep knowledge of astrology, mythology and the psyche to answer these and more questions, whilst exploring Neptune's mysterious realm. Richard will also explore how the current series of Jupiter-Neptune squares that are taking place throughout 2019 are manifesting. Both planets are in the sign of the zodiac they rule - Sagittarius and Pisces respectively. Richard's astrological education began in 1976, learning traditional, horary, and occult-theosophical approaches within the context of the Western Mystery Tradition. After an extended exploration of the work of Noel Tyl, 1980-84, Richard then began studying at The Centre for Psychological Astrology (CPA) gaining their Diploma in 1994. After teaching astrology independently for 20 years, Richard was invited to join the staff of the London School of Astrology teaching both horary and psychological astrology. As a psychotherapist since 1994, Richard has worked for MIND, St. Thomas's Hospital and privately. Now located in Bristol he sees clients online and in person for both psychotherapy and astrological consultation. His main teaching in astrology stresses the importance of training the intuition. ​Three new planets, plus one upgraded, one downgraded and five candidates, to complement the nine that we’re already using. Alan Clay brings look at our busy new solar system and how the new dwarf planets extend astrology into a richer and more spiritual perspective on the chart. • Eris (consciousness through discord). To find where these bodies are in your birth chart click here to go to astro.com. Click on Ephemeris (the bottom item in the menu on the left) and then on "Special Body"
Wished you hadn't missed another great evening at Aquarius Severn!? Then sign up to our notification service and receive an email notification of talks and social events. Get updates on your mobile: www.twitter.com/AquariusSevern or visit us on Facebook (Aquarius Severn Astrology Society). hosts regular workshops with top astrologers, for which Aquarius Severn members pay a concessionary rate. 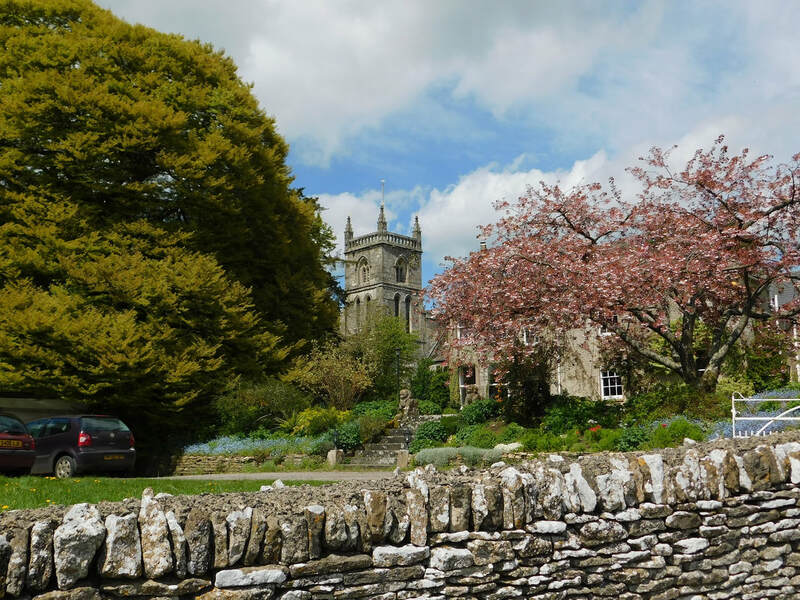 hold talks on the first Monday of every month at Waterfront House in Bath and also host occasional workshops and seminars with well-known astrologers. Membership is renewable in April each year, although 6 month membership can be taken out from October 1st (see below). Please note that the free gift is only applicable during April and May, when taking out annual membership. In all you could save up to £24 over the year by joining Aquarius Severn in the Spring! 6 month membership can be taken out starting October 1st, for £10 (£15 for joint membership). Visit our Membership page for full details. Please note that our free gift for members is only available when taking out annual membership during April or May of each year, and is not available when taking out half-year membership. Otherwise all the benefits of joining remain the same. 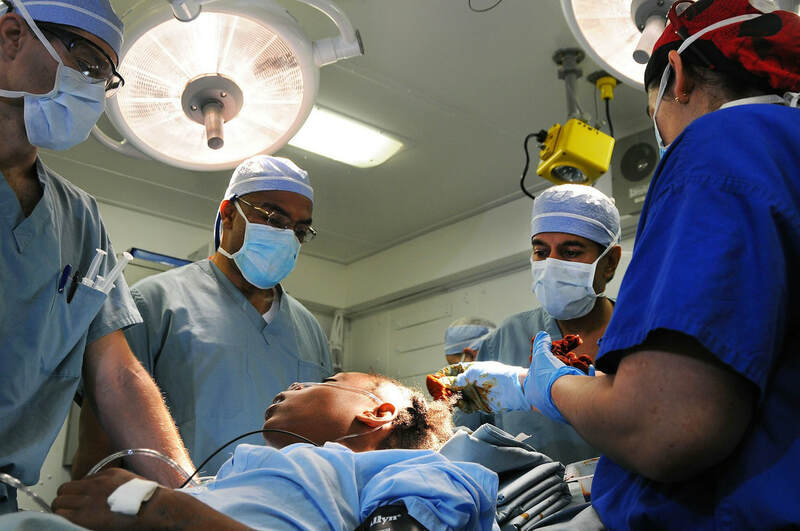 Aquarius Severn is run on a not-for-profit basis by the unpaid committee and other volunteer helpers, and sometimes it is difficult to make ends meet! You support us by coming to our events, but if you'd like to help the society further, we welcome donations which can be made using the online facility below. Our library (available to members only) is growing, after we received a large donation of books recently, and we have two library cupboards at 2 Wolseley Terrace. Members of Aquarius Severn can borrow books displayed at our talks and workshops, as well now as those we share with the Bristol and Bath Astrology Circle. Yes we know the Sun, Moon and Node (and possibly Chiron and Pluto) aren't "planets", but it's the shorthand way of referring to them! A short course comprising five 2¼-hour sessions on Tuesday evenings led by Graham Boston is running Autumn 2108 at The Isbourne Centre. The course is suitable for complete beginners as well as those with some knowledge already, and by the end of it you will understand the meaning of astrological symbols, the sturcture of birthcharts and how to interpret them at an introductory level. Cast your birthchart - instantly! Alternatively, for a birthchart you can store and print, click here to go to the Free Birthchart page at Astro.com. Astro.com has many resources available for free, and more if you create a free account with them. You can bring your printed birthchart to our talks. For an interpretation, it is probably best to have a consultation with an astrologer, as it is easy to be overwhelmed by the information contained in printed or web interpretations. Or come to Aquarius Severn, and one of our friendly astrologers may have a brief chat with you about your chart during the refreshment break!